Comments on public forums like Youtube and social media platforms have become one of the most common ways we communicate with each other. But because they are public, anyone can say anything. Often resulting in a lot of information not relevant to the subject. Whether it’s trolling or just having side conversation, more popular pieces of content can have thousands of comments covering up valuable pieces of feedback and insight for both the publisher and those interested in the subject. Sites like Wikipedia use crowd sourcing to create one summary of a particular subject. It relies on contributors to spend their own time curating information. Popular streaming sites like Twitch.tv allow a streamer to appoint moderators who monitor their chat, and help with stream functions. A combination of these two concepts can be combined to create moderated, curated comments for popular videos. More than one moderator may cover the same comment. However, to the reader, that is unimportant. What is more beneficial to the reader is the summary this moderator outputs. 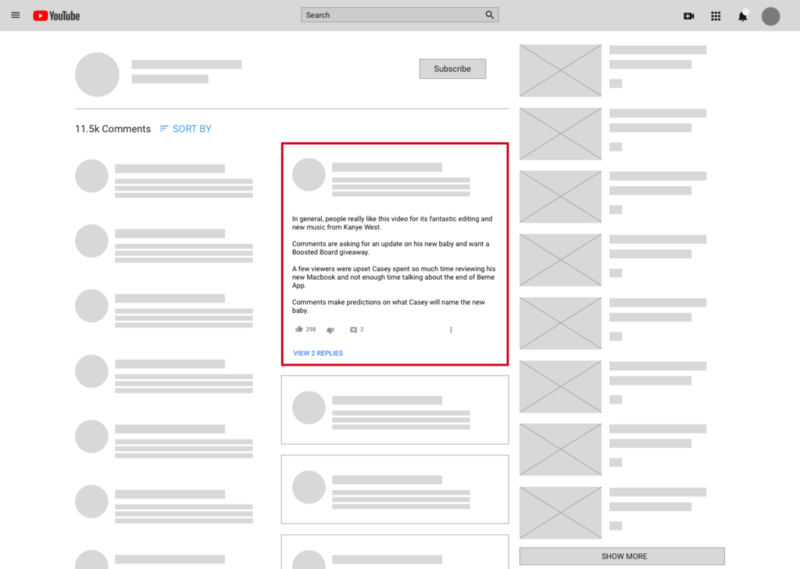 If a YouTube video has thousands of comments, it’s much easier for the publisher and viewers to read through 4 or 5 excerpts to get the details and opinions of everyone commenting. The most useful method of including this feature is to place it in the comments section. This allows the user to read through individual comments as well as read a summary of them. On the left, there are the individual comments, just like the site shows today. In the middle, there are accordion tiles to view summaries provided by the moderators. Selecting a tile, removes the comments that were added after this moderator created the summary. 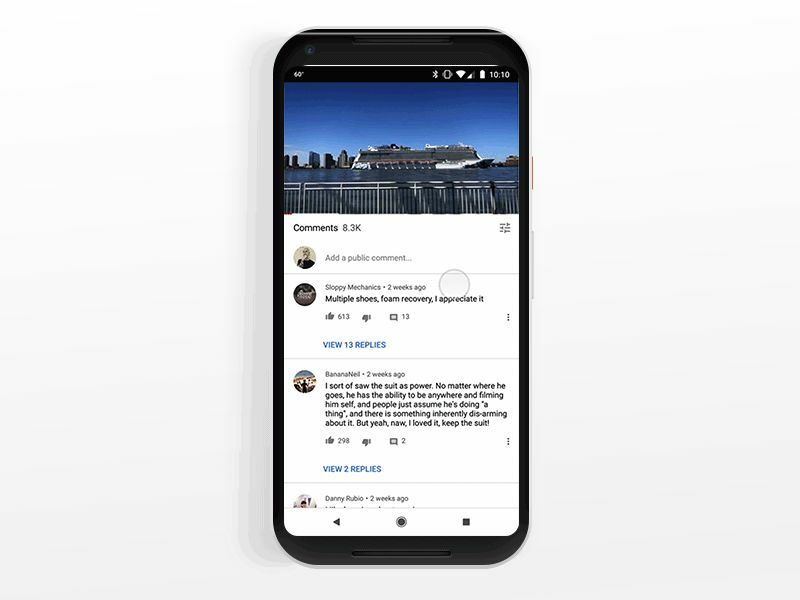 This enables a more accurate representation of what they are summarizing, as well as allows the viewer to scroll back through the comments to “read more”. On mobile it’s a lot more challenging to offer the same kind of interaction between the UI available to the viewer and the amount of screen real estate this feature requires. But if the objective is to read a summary of all the comments, we can just use the sorting filter already available and create a single channel reading experience. It’s so refreshing to see such a small number of comments, it feels like I may be able to read them all. Viewers can comment on the summary, but only an appointed moderator can write a summary. The prototype below shows how the feature is integrated into the filter option currently available.